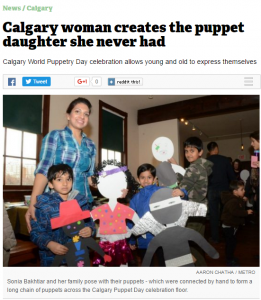 On March 21, 2016, WP Puppet Theatre launched Calgary Puppetry Day, in conjunction with World Puppetry Day, for the first time in Calgary, with a day of fun, imagination and creativity for all ages. 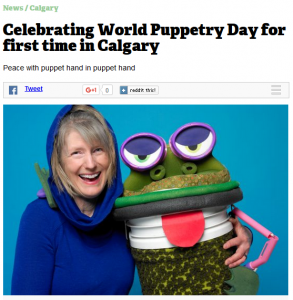 In conjunction with the event, the City of Calgary proclaimed March 21 World Puppetry Day. It was a busy day at Fort Calgary with over 500 participants who made over 250 puppets using our templates and baskets of found craft items. Our colourful and fun puppet personalities created a visual metaphor for connecting diversity, generations and community. Participants were also invited to give voice to their puppet on our video. At the Puppet Open-Mic, participants enjoyed short puppet performances by Pete Balkwill from Old Trout Puppet Workshop, Kathryn Smith & Alison DeRegt from Pape and Taper, Iam Coultier from Quest Theatre, Leah and “Jack” of Fort Calgary, Michelle Warkentin with “Twinkle”, and our very own Wendy Passmore-Godfrey with “The Greedy Frog.” Participants also got to interact with some giant puppets, the owl courtesy of Tam and bride courtesy of Ian and Gene of Mudfoot Theatre! This event was a kick-off for our Biennial Puppet Power conference, taking place May 28-29 2016. 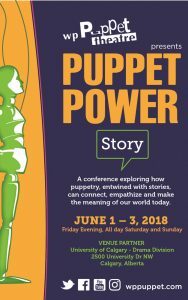 Puppet Power 2016’s theme, “connecting generations”, examines the compelling strength of puppetry in advocating, educating and celebrating community connections across generations. 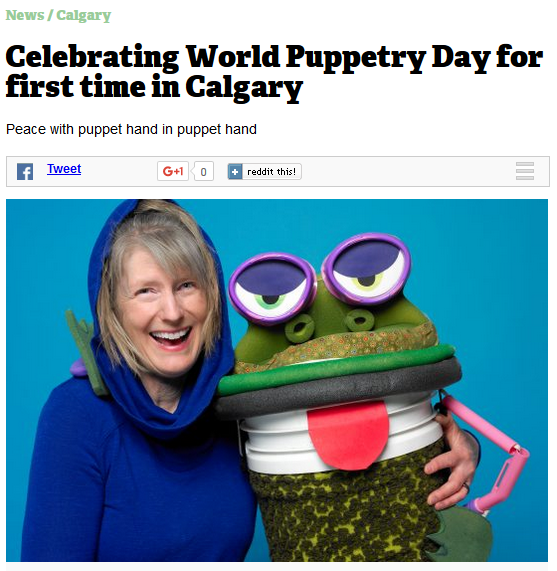 CALGARY PUPPETRY DAY IN THE NEWS! Monday’s World Puppetry Day celebration allowed Calgarian Nadia Asad to realize a lifelong dream. Meanwhile their kids were expressing themselves through puppet ninjas, and a man made entirely of stickers. The World Puppetry Day celebration, held by WP Puppet Theatre, encouraged people to create a puppet and add it to one of the chains of puppets set up through the space, all holding hands. 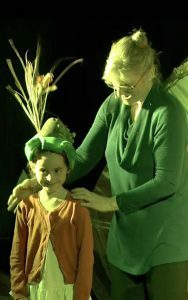 Interview with Artistic Director Wendy Passmore-Godfrey at Calgary Puppetry Day on March 21st at Fort Calgary. 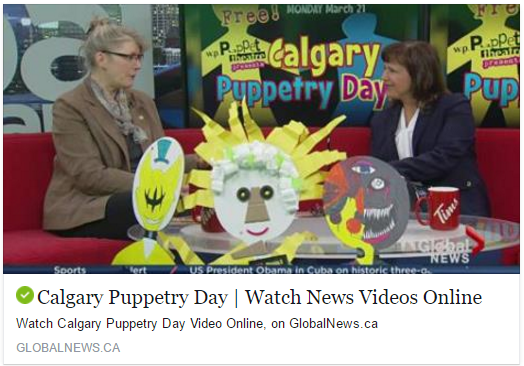 Interview with Artistic Director Wendy Passmore-Godfrey about Calgary Puppetry Day on Global TV morning news.